Traffic flow plates are designed to control the flow of traffic by ensuring vehicles pass over them in a certain direction. 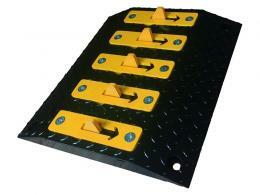 These flow plates from The Workplace Depot offer a simple and low cost way to prevent vehicles entering car parks and sites through a designated exit point, improving safety and reducing the chances of accidents. The flow plates are ideal for use in car parks, one way systems and for preventing residential areas turning into manic runs. 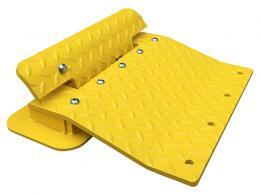 Our flow plates are quick and easy to bolt to the road’s surface, so they can be ready to use in no time at all. Our standard flow plates have been designed to safely and effectively control the flow of vehicles such as small vans and family saloon cars. 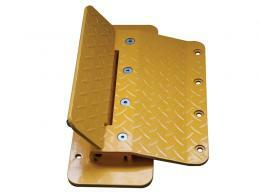 If you need to provide a more effective physical barrier against the flow of traffic and against heavier vehicles such as HGVs, trucks, commercial vans and larger 4x4s, have a look at our range of HGV flow plates. 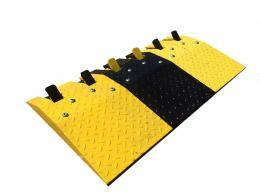 The Workplace Depot offer a wide range and variety of flow plates, from traffic directional ramps to HGV traffic control plates. Our professional and experience staff are happy to explain the benefits of each type of product should you need help deciding exactly which type of plate will suit your needs best. Give our sales team a call and they will talk you through the different benefits and functions. The Workplace Depot offers a one-year warranty on all parts and labour as well as a Price Promise to match any price. 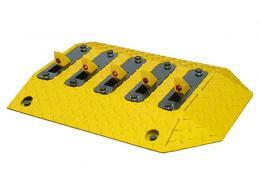 Order your flow plates and get free next day delivery. When it comes to payment, we accept all major credit cards including Maestro, Visa, MasterCard and Visa Debit as well as PayPal.